The number of Europeans who move to other Member States is increasing every year. The EU Treaties made this easier than ever, giving European citizens the right to work and the right of residency in all Member States. We shouldn’t forget though that the Treaties also gave European citizens other rights, such as the right to vote in local and European Parliament elections or even to stand as a candidate in other European countries. If you live abroad in another Member State and you are interested in the day-to-day politics of that country, why shouldn’t you get involved in its politics? You can be active either as a volunteer, campaigner or even stand as a candidate! GEF’s Campaign Handbook interviewed Sergi Corbalán and Ania Kitcat, originally from Spain and Poland, who both ran for the Greens in Belgian and UK local elections respectively. They share with us their positive experiences. Sergi Corbalán was born in Barcelona and after his studies he moved to Brussels initially for 6 months but has ended up living there for 12 years now. He is the director of the Fair Trade Movement Political Advocacy Office before the European Union, coordinating political advocacy and campaigning work in support of Fair Trade and Trade Justice. When Sergi was first able to vote in the local elections in Brussels in 2006, he already voted Green. When local elections were next due to take place, in 2012, he decided he was ready to take a step further and run as a candidate for the Greens in the Brussels commune of Saint-Gilles. “After 12 years of living in Brussels I consider myself a local, with rights to vote for the local and European Parliament elections. I wanted to go a step further and also to take up the right to be a candidate in the local elections”. Although Brussels has a huge number of foreigners living in it, less than the 20% of them have registered to vote. According to Sergi Corbalán, this creates the risk that political parties do not pay enough attention to issues faced by foreigners. That is why during his campaign, Sergi tried to encourage non-Belgians living in Brussels to register and to vote so that foreigners’ voices could also be heard. Why local politics, why with the Greens? “I did not know much about local politics in Belgium, but I was very interested in knowing more about how political decisions at a local level can have an impact on the daily lives of people.” To be involved in local politics, as Sergi explained, is also a great opportunity to get to know your neighbours, your city, community groups and to better integrate yourself in your new country. 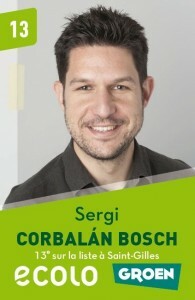 Sergi Corbalán had already participated in some Groen–Ecolo (Groen, the Green Party for the Dutch speaking community and Ecolo, the Green Party for the French speaking community) activities and campaigns, but he is not a member of either Party. He had been however impressed by the good work done by the local Ecolo-Groen section in Saint-Gilles. He therefore accepted the invitation to run in the joint Groen-Ecolo list as a “candidat d’ouverture”. By opening up lists to non-members, Ecolo and Groen aim to build links with civil society and citizens and involve the largest number possible of people in politics. In his eyes, Ecolo-Groen is the party that was addressing best today’s and tomorrow’s societal challenges, by aiming at social progress and people’s emancipation, while at the same time putting this in a framework of the limited resources, inequalities between North and South and growing social inequalities within societies. Sergi was also pleased with how Groen and Ecolo were doing politics in a more transparent and democratic way, by putting in place, in his view, a more transparent internal decision-making process than other parties. He stresses the importance of both parties’ policy of giving as many political offices as possible to as many people as possible, in or beyond the party. “It’s is very important that people who are not working full-time on politics can also take part in the political decision-making processes in order to break the perceived division between citizens and politicians”. When Sergi Corbalán ran as a candidate on the Groen-Ecolo list, his priority wasn’t to try and appeal to the Catalan or Spanish community. Instead, he chose to reach out to as many citizens as possible, with a special focus nevertheless on the wider community of foreigners living in Brussels, regardless of their nationality. “When you decide to run your campaign as a foreigner, you have to choose whether and how to use politically your membership to a particular community or group. If your sole objective is to be elected, it is probably more effective to do so. However, this may also give the impression you are a candidate representing one specific community, which is not what I wanted to do”. Parties also benefit from having immigrants on their list, as they bring new ideas and new networks. Having foreigners in the Brussels Greens lists makes the lists more representative of the city population and contributes to creating a society where all the voices are heard. Although Sergi was eventually not elected, he thinks that Groen-Ecolo´s policy of integrating people from different nationalities is a practice that should be continued and strengthened. However, he cautions that diversity isn’t just about recruiting immigrants to run; there also has to be other kinds of diversity that must be ensured, such as candidates from different socio-economic backgrounds. It is also important to address the diversity within the leadership and elected positions in government and within parties, which, in his view, seem to take longer for foreigners to have access to. Ania was born in Poland and in 1998 she decided to move permanently to the UK where she finished her studies. Ania worked part-time as a local party coordinator for the Brighton & Hove Green Party and in 2011 she was elected to represent Regency Ward in central Brighton. She is the first Polish citizen elected to local government in Brighton and Hove. The Green Party in Brighton is very dynamic, well organised, and strong, something Ania Kitcat wanted to be part of. Brighton and Hove is one of the few places in the UK where the Green Party is considered one of the major parties and in 2011 the Green Party in Brighton and Hove managed to win most seats on the Council which meant that they formed the first Green council administration in UK history. According to Ania, the UK is a society that is open to foreigners and many of them are involved in politics, especially in the Green Party. As an immigrant, Ania recognises that at first a lot of immigrants’ free time is spent in reconnecting with their country of origin (organising cultural societies, language schools) but, when they have decided that the UK is their permanent home, they tend to be quite active in terms of voting and elections. As an immigrant, one can be unfamiliar with the political system and discussions in their host country. Although this was not the case for Ania Kitcat, who has an extensive background in Politics (holding a bachelor, several masters and a politics-related Phd), Ania warns that is very important to be aware of the political differences from each country. “For me, the most striking difference between the British and Polish political systems is in the electoral system. In Poland you have predominantly PR (proportional Representation). In the UK it is the ‘winner takes all’ known as ‘first-past-the post’. That in turn has a massive impact on the political systems of the countries. In Poland you have many parties, coalitions, negotiations etc. In the UK it is predominantly a two party system with each party (either the Conservatives or Labour) taking charge in turns but not because they have attractive policies but due to the fact that people get feed up with the incumbent party and go for the opposite option. The electoral difference is also in the type of campaigning. I don’t recall canvassing taking place in Poland (I don’t think this has changed in the time I have been living in the UK). Local elections in Poland are media based while in the UK it is primarily the canvassing that wins elections”. To be able to understand these differences it is also useful to have a prior engagement in the party or in politics for some years. According to Ania her prior involvement in running the Green’s local office (managing volunteers, dealing with public inquires, getting involved in campaigning for elections) and work as local party coordinator, gave her an additional understanding of how things were done, not only theoretically but in practice. Unlike Sergi, Ania did try to mobilise the Polish electorate. She stood in an area that had a higher number of Polish residents and an organised polish community. She was also involved in this community (sitting as a trustee on the board of a polish charity and in a Polish Saturday School) and even producing campaign leaflets in Polish explaining the process of vote registration. However, the mobilisation of the Polish community was not her main goal, as she was also appealing to the wider electorate in the ward. As in all campaigns “this means lots of leg work: canvassing, leaflet delivering, community meetings…”. 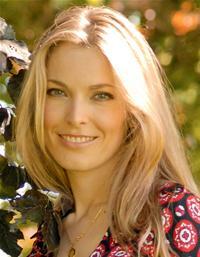 In fact, Ania did succeed quite spectacularly in appealing to the British electorate; she scored the highest percentage of the vote out of all 54 Green candidates, making her the most popular Green candidate. “Just do it, not only you will learn a lot about local politics, it will also make you feel even more at home in the country that you have moved into. Do not wait until election time before contacting the Party, show your interest before. The campaigns are prepared months before the elections. Getting involved early will allow you to understand better the issues at stake and to contribute to the drafting of the programme, which will make you feel it is -your-campaign”. “Do it, do it, do it! Or if you are not too sure, go along to one of the local party meetings. Get to know people. Get to know policies. Find something that interests you. Don’t be put off by something that you disagree with. There are no parties in the world that will tick all your boxes- be realistic. If you find that the Green Party is the right balance for you then you can get involved in varying degrees: as a volunteer, campaigner, try to apply for some professional positions or ultimately stand as a candidate”.